I don’t like dirty things. Sure, I can be messy, but messy doesn’t necessarily mean dirty. Just because things look out of place or cluttered in a space doesn’t mean they aren’t clean. Does that even make sense to you? Because it does to me. The truth is that I constantly worry about people around me getting sick because of germs. This is, most likely, the effect of having lived with a doctor for 32 years. Because of this, I have a set of cleanliness-related rules that I try my best to enforce at home. First, I make sure to choose antibacterial soaps for our laundry, dish washing, and baths. We have been loyal Safeguard users for many years. 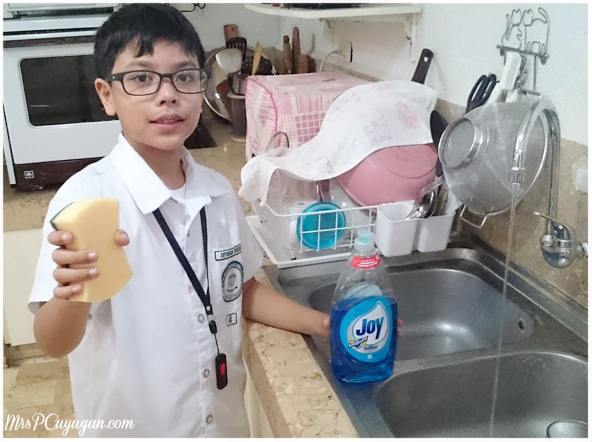 Not just for bath time – Our dishwashing and laundry soaps both have Safeguard in them. Also, I absolutely will not allow anyone to sit or lie down on their bed wearing clothes that were worn outside. I just think it’s gross that MrC’s office shirt, for example, which comes into contact with a tricycle seat, a van seat, his office chair, various walls, tables and other surfaces, and even other people throughout the day, will come into contact with my pillow, blanket and bed sheet. When people come visit our home and sit on the bed wearing clothes they’ve worn outside, I change the sheets before we go to bed. I’m not kidding. The boys and I do not walk around the house in shoes. We use our house slippers when we are home. We also ask people to remove their shoes and slippers before going up to the second floor of our home. When upstairs, the boys and I go barefoot, too. We make hand washing a must before meals. I even have bottles of alcohol and hand sanitizer in our living, dining, and bedrooms just in case. I have a slight alcohol-obsession (rubbing, not drinking,) and I usually clean my hands with the stuff in between tasks, when hand washing is not possible. The list goes on, and on, and on. I could bore you to tears just talking about this. Did you know that sanitation issues are largely responsible for illnesses like diarrhea, which is a leading cause of child death in the Philippines, right next to malnutrition, pneumonia and injuries? So where is this conversation going, you may be wondering? Well, recently, Little MrC and I attended UNICEF and Safeguard’s first Health Watch lecture in celebration of World Health Day. We learned a lot at the session, and a lot of my germy-worries were addressed and validated. It’s good to know that my cleanliness rules are actually good for something. Intervention should be the priority. Health comes first. I feel like these are the most important lessons we learned that day. Instead of waiting until someone gets sick to do something, we should instead aim to reduce the risk of illness, especially within the home. This can easily be done through proper hand washing with soap. 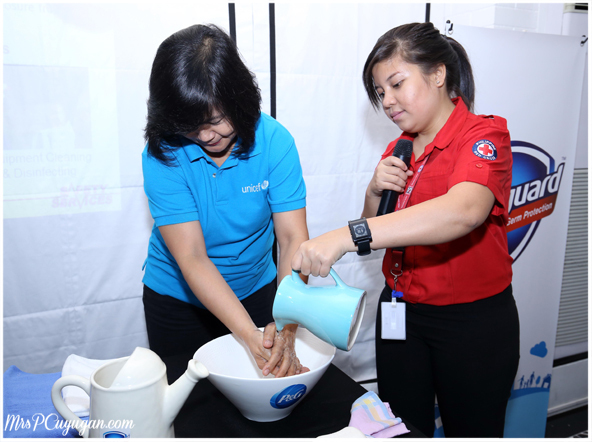 This handwashing demo was really useful. It surprises me that not a lot of people know how to properly wash their hands, but this is a reality. Start by wetting your hands well. Lather well and scrub thoroughly. Don’t forget to scrub in between your fingers, and all the way to your wrists. Scrub for at least 20 seconds. You should be good to go after two rounds of the Happy Birthday song. Singing out loud is optional. Rinse well, and make sure that there is no soap left on your hands and wrists. Dry off using a CLEAN towel. Emphasis on clean. I think you know why. As a final note, we were taught some first aid basics by a representative from the Philippine Red Cross. I love that my son already learned most of this during a father and son camping session that he and MrC attended. At least I know that if there’s ever the need for emergency response at home, my boys are ready to save me. Lol. As moms, our family’s health and safety should be on top of our list of priorities. Do you have any tips for keeping your households safe and germ-free? Thank you so much for this post! Very insightful! Cheers!